Donna was looking for a standing desk that would help her relieve some of the neck and shoulder pain she was having. 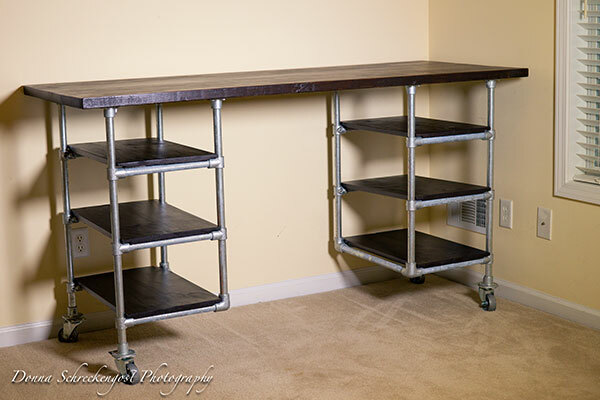 The result, is this industrial desk that one of our customer service guys, Michael, helped Donna design. "I can't thank you enough for your assistance with my standing 'Q Nelson' inspired pipe desk. 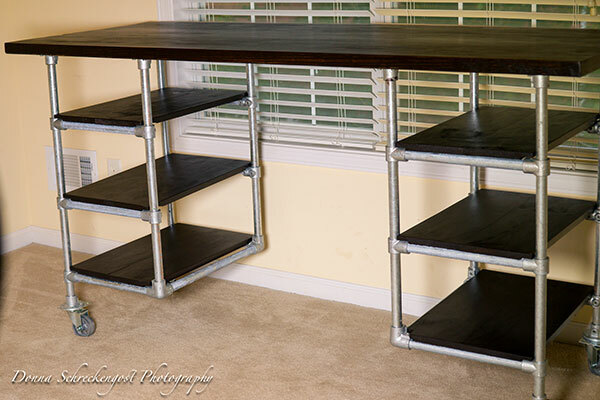 I would have never figured out the pipe measurements and fittings to build the desk at my desired height of 39 inches. Again, thank you from the bottom of my heart!!! You are a life saver for helping me to create a desk that is ergonomically correct for my height and will take the necessary pressure off the nerves in my neck and arm giving me much needed relief from daily pain." The desk frame utilizes Kee Klamp fittings and pipe, which is then paired with the desk table top and shelving, to complete the unit. It stands at 39" high, 60" long, and 28" deep. Below, are the fittings and pipe needed to create the desk frame. However, the design can be modified based on the height, length, and depth you would like. The number of shelving can also be modified. For help coming up with a design that will work for you, feel free to reach out to our projects team for free design assistance. 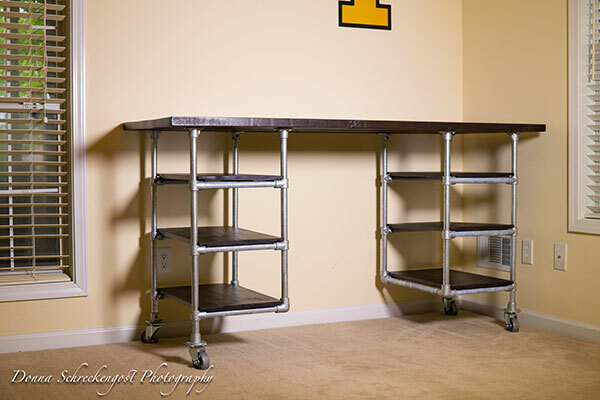 8x Flange fittings, or 4x Flange fittings and 4x Casters, depending on what you'd like to use for the desk "feet". Donna bought four Flange fittings for the feet. She then mounted vintage casters, she had laying around, to the bottom of the Flanges. 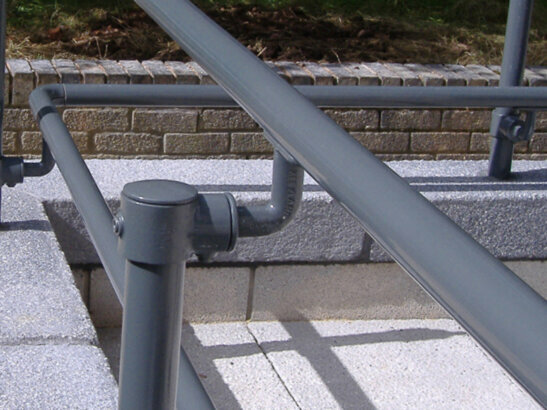 Alternatively, our Caters will go straight into the pipe making for a perfect fit and more simple solution. Pipe. Remember, the dimensions are entirely up to you based on the length, height, and depth you would like. Follow the diagram below, and the proceeding steps, to assemble the desk. As with any Kee Klamp project, exact order can depend on how you would like to approach the assembly process. However, the order of steps listed below, are recommended. First, start by assembling the desk frame. The frame is constructed of two "main" sections. Each of these main sections are constructed of two "legs" and the horizontal supports that connect them. To create the legs, follow the diagram in Step 1. Slide one Flange fitting onto the bottom of the pipe, two Single Socket Tee fittings on, and another Flange fitting onto the top of the pipe. Then using an Allen Wrench, tighten down the set screw to each fitting, to secure it to the pipe. Also, when setting the height for Single Socket Tee fittings, you may want to use a measuring tape to mark the height. These fittings will be used to create to horizontal supports that hold the desk shelving. 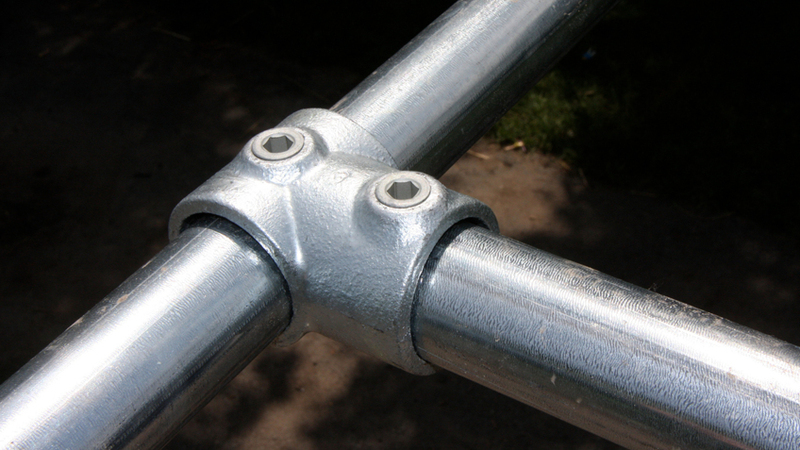 So you will want to make sure the height of these fittings is consistent across all of the frame legs. The leg so far should look like the diagram pictured in Step 2. Next, follow the diagram in Step 3 to complete the leg. The other side of the leg will utilize one Flange fitting, two Single Socket Tee fittings, and one Side Outlet Elbow fitting. The two uprights can then be joined together to complete the leg. You will do this until you have four legs. Then, join the legs together as pictured in Step 4. 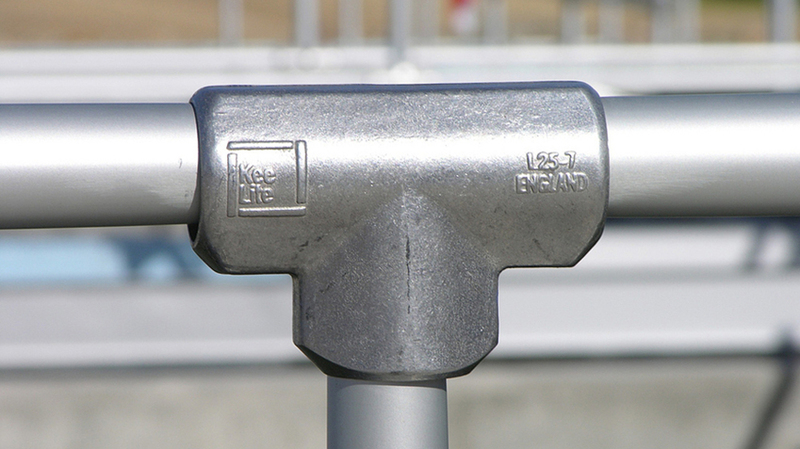 The legs will connect by sliding a length of pipe into the open socket, on the Side Outlet Elbow, on each of the legs. Tighten down the set screw to secure the pipe in place. Do this for both sides. You should now have two sections as pictured in Step 5. Now, you can attach the desk table top. First, place the table top over the frame. From there, you can secure the table top to the frame. Each Flange fitting has four holes in it for mounting the table top (best illustrated in Step 7). Use the appropriate hardware (likely wood screws if you are attaching a wood table top) and screw into the bottom of the table top. Then, you can slide the shelves onto the horizontal supports. These shelves rest in place on top of these supports. That's it! 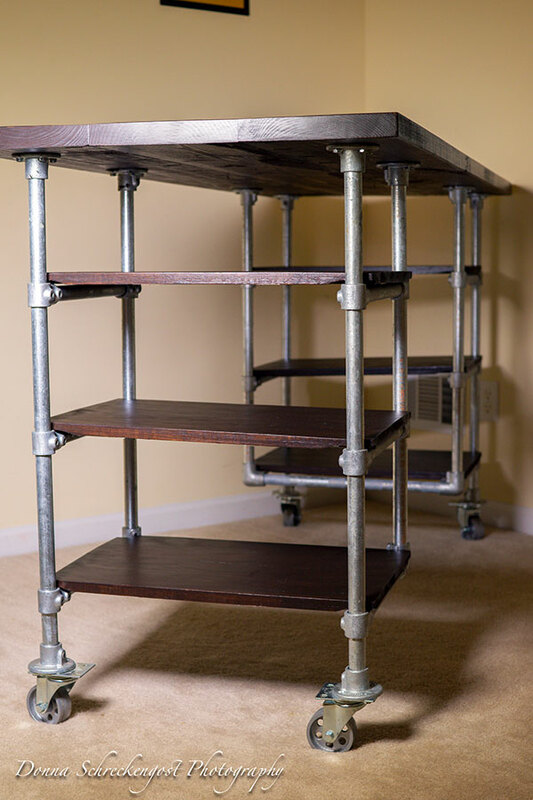 You should now have a complete industrial pipe desk with integrated shelving. If you have any trouble assembling the desk frame, please don't hesitate to reach out to our projects team for help (projects@simplifiedbuilding.com). We will gladly assist you in your project, whether it's coming up with the design or if you get stuck putting it all together. Finally, we do offer a few desk & table frame kits for a simpler approach, try browsing our selection to see if there is a fit for you. Did you enjoy this article? Let us know in the comments below what you thought of Donna's desk and be sure to sign up to our email newsletter to receive updates on future projects like this one.